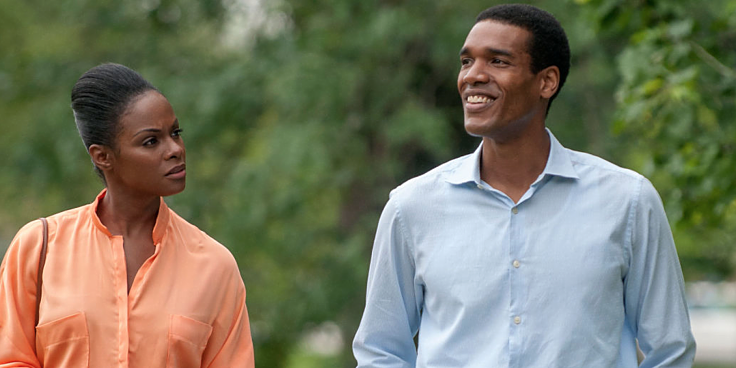 THE STORY - Future U.S. President Barack Obama (Parker Sawyers) and lawyer Michelle Robinson (Tika Sumpter) go on a fateful first date in the summer of 1989. It's pretty remarkable really that we are getting a film about the President of the United States while he is still holding office. "Southside With You" however is not a political drama dealing with the back door conversations, debates and/or political dilemmas that the Commander In Chief must deal with on a day to day basis. Instead, "Southside With You" takes its cue from the "Before Trilogy" and showcases two people in the span of one day as they simply walk and talk. It's light-hearted, intimate and somewhat underwhelming. It's Chicago in the summer of 1989. Barack Obama Parker Sawyers) has tricked Michelle Robinson (Tika Sumpter) on a date with him as he wishes to go visit an art exhibit and hopefully catch Spike Lee's newest film "Do The Right Thing" at some point. However, Michelle understands that the two only recently started working together and is not on over right away by the smooth talking Barack. As the day progresses the two talk about culture, art, life, all the while trying to feel out the other's defenses and intentions. Both Tika Sumpter and Parker Sawyers turn in fine performances that feel just like that, performances. They don't veer into distracting impersonation at any point despite Parker Sawyers playing closer to his real-life counterpart than his co-star does. There's one scene in particular where he ahs to give a rousing speech at a community meeting at a local church which signifies the type of leader he would one day go on to be. From his speaking patterns to his voice and mannerisms, Parker nails it. Tika Sumpter has the more challenging role of the two as she must keep this new man in her life at an arm's reach to protect her image at her job seeing as how the two work together. As the film progresses you slowly see her start to lower her defenses for this charming man and you realize that the film is simply a "Will they or won't they?" Unless you've lived under a rock for nearly the past decade, then you know how this one turns out. The film may lose some emotional investment from people due to the predictability of the story but the sincerity and willingness to avoid more dramatic issues leaves the film feeling light and always enjoyable. Director/Writer Richard Tanne gives equal weight to both his leading stars in his screenplay as each character is seen from the other's respective point of view. Sure, Barack Obama may be The President of the United States and as a result, his character will be the one that people watch out for the most but Tanne (And Tika Sumpter as stated before) ensure that this doesn't happen. The two walk and talk about their lives, their goals, the current state of their community and along the way "Southside With You" becomes a simple, light-hearted moviegoing affair that is not asking too much of its audience. And if the simplicity of the movie has you begging for more from its premise, then luckily for you, it clocks in at only a breezy 84 minutes. "Southside With You" doesn't have high ambitions and it shouldn't. This is not "House Of Cards" or even a single film from the "Before Trilogy." This is a non-threatening, easily digestible story of how two people just so happened to have one of the best dates ever on a particularly humid Chicago day. If that sounds kind of plain for you, then it probably is.